For Valentines Day i mad this chocolate brownies with vanilla ice cream from the great blog "Pinch my salt"
Line a jellyroll pan with plastic wrap. In a large bowl, stir together the softened ice cream and Irish Cream until well combined. Spread ice cream evenly in the jellyroll pan. Cover with plastic wrap. Freeze for several hours or overnight. Preheat oven to 350 degrees. Lightly grease an 18”x13” jellyroll pan then line the bottom with parchment paper. In a small bowl, combine Kahlua, instant espresso and vanilla; stir until coffee is dissolved. In a large bowl, combine brownie mix, eggs, oil, and Kahlua mixture; stir together until well combined. Pour mixture into the jellyroll pan and, using a spatula, gently coax the mixture out to the edges of the pan. Once the mixture has been spread as evenly as possible, smooth the top with a spatula. Place pan in a preheated, 350 degree oven. Bake for 12-15 minutes. When brownies are done to your liking (12 minutes for gooey, 15 for well-done), remove from oven and let cool completely on a wire rack. Cut brownies into heart shapes using a cookie cutter. Use a spatula to carefully lift and remove the cut brownies to a separate platter. After all the hearts have been cut, cut the remaining pieces of brownie into bite-size pieces and store in a plastic bag for nibbling later. Wash and dry jelly roll pan then spread the brownie hearts out in a single layer in the pan. Next, clear a large area on the counter and remove ice cream sheet from freezer. Place the tray of brownies within easy reach. Remove top layer of plastic wrap from ice cream. Working quickly, cut ice cream into shapes using the same cookie cutter you used for the brownies. As soon as you cut a piece of ice cream, quickly remove it by pushing up from the bottom with your fingers. This will get messy. Place the ice cream shape on top of one brownie and cover with another brownie. If desired, repeat this process to create a double decker sandwich. Continue until all brownie pieces have been used up. Cover pan of sandwiches with plastic wrap and immediately place in the freezer. Scoop remaining bits of ice cream into a plastic container and freeze for later (you can eat it with the extra brownie pieces). After about an hour, the sandwiches can be individually wrapped in plastic if desired. Ice cream sandwiches can be eaten by hand straight out of the freezer or for a special occasion, mix a little Kahlua with store-bought chocolate syrup, drizzle on a plate and top with the ice cream sandwich. You could even add a dollop of whipped cream! Preheat oven to 425, and line a 12 cup regular muffin pan with paper liners. Add milk, melted butter and beaten egg, and mix with a fork. muffin batter should be slightly lumpy, not smooth. Divide batter between the muffin cups. My favorite part of joining The Daring Bakers is the excitement every month that comes from exploring new recipes. This month our chalange was from our neighbors to the north and the host of the 2010 winter Olympic games, Canada. The opportunity to create the Canadian chocolate bars, Nanaimo Bars was a refreshing change from my usual baking. I kept the original recipe in order to create the most authentic foreign delight. My family and I thank Lauren for exposing us to this yummy bars. The January 2010 Daring Bakers’ challenge was hosted by Lauren of Celiac Teen. Lauren chose Gluten-Free Graham Wafers and Nanaimo Bars as the challenge for the month. Add the butter and pulse on and off on and off, or mix on low, until the mixture is the consistency of a coarse meal. In a small bowl, whisk together the honey, milk, and vanilla extract. Lay out a large piece of plastic wrap and dust it lightly with flour, then turn the dough out onto it and pat it into a rectangle about 1-inch thick. Sift an even layer of flour onto the work surface and roll the dough into a long rectangle about 1/8 inch thick. The dough will be sticky, so flour as necessary. Trim the edges of the rectangle to 4 inches wide. Working with the shorter side of the rectangle parallel to the work surface, cut the strip every 4 1/2 inches to make 4 crackers. 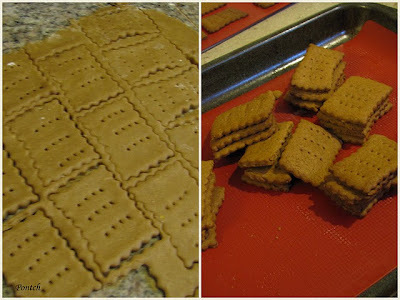 Place the crackers on one or two parchment-lined baking sheets and sprinkle with the topping. Chill until firm, about 30 to 45 minutes in the fridge or 15 to 20 minutes in the freezer. Finally, gather any scraps together into a ball, chill until firm, and re-roll. Melt unsalted butter, sugar and cocoa in top of a double boiler. Add egg and stir to cook and thicken. Stir in crumbs, nuts and coconut. Press firmly into an ungreased 8 by 8 inch pan. Cream butter, cream, custard powder, and icing sugar together well. Melt chocolate and unsalted butter over low heat. Cool. Once cool, pour over middle layer and chill. Get the My favorite kitchen widget and many other great free widgets at Widgetbox!